If there’s one thing we know about Bernie Sanders, he sure doesn’t like Henry Kissinger. And if there’s one fact that he likes to deploy in his foreign policy case against Hillary Clinton, it’s her vote authorizing the Iraq War 14 years ago, when Clinton was just in her second year as a senator from New York. 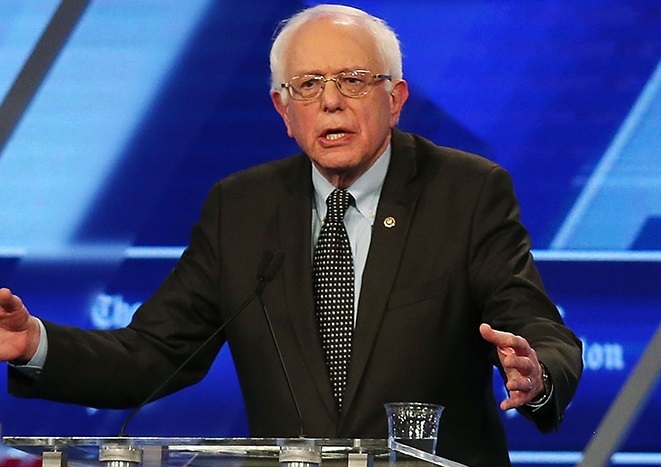 But aside from the Kissinger snark and some minor back-and-forth over US policy in Cuba, foreign policy played only a little role in Wednesday night’s Democratic presidential debate, and it’s played an equally minor role throughout the entire contest. On one hand, that’s because the Sanders insurgency has zeroed in on income inequality, the growing wealth gap and the role of wealthy donors in campaign finance. But it’s also because Clinton, whether or not you trust her judgment, is the most qualified non-incumbent candidate in decades when it comes to international affairs. In addition to her service in the US senate, she also served for four years as secretary of state and eight years as first lady. It’s truly formidable. Yet, given Clinton-Sanders dynamic, there’s still a lot of space for Sanders to make a strong foreign policy case against Clinton, and time after time, Sanders just hasn’t made that case. Maybe that’s politically wise; shifting his emphasis from Wall Street and income inequality would dilute his message with an attack based on issues that seem far less salient to Democratic primary voters. But it’s true that Clinton’s foreign-policy instincts have always been more hawkish than those in her own party and, often, those of president Barack Obama and vice president Joe Biden (who, according to Jeffrey Goldberg’s amazing piece in The Atlantic about Obama’s world view, said Clinton ‘just wants to be Golda Meir’). To some degree, the problem with challenging Clinton on foreign policy is that Sanders would largely be challenging the Obama administration, and that’s tricky when you’re trying to win the votes of an electorate that still adores Obama. But Sanders certainly hasn’t shied away from stating clear differences with the Obama administration’s approach to domestic policy. Moreover, to the extent that Sanders made a clear and cogent case on international affairs, he could claim that his more dovish approach represents true continuity with the Obama administration (and that Clinton’s more hawkish approach shares more in common with a potential Republican administration). There’s no doubt that Sanders is a talented politician; in one fell swoop, he could use foreign policy to drive a wedge between Clinton and the Obama legacy. That’s a very powerful tool, and it’s one that Sanders, so far, hasn’t been interested in wielding. Fairly or unfairly, Sanders is tagged as a one-issue protest candidate, and he suffers from the perception that his candidacy’s purpose is to nudge Clinton further to the left, not to win the Oval Office. By adding a foreign policy element to his critique of the Democratic frontrunner, Sanders could bend a more skeptical media into taking him more seriously and show voters that he really can fill out what Americans expect from a president. In the 21st century, like it or not, the president is the chief policymaking official when it comes to foreign policy. Given the stakes involved, it’s not too late for Sanders to make this case as the Democratic contest turns to larger states like Ohio, Illinois and Florida next week and, after that, Pennsylvania, New York, New Jersey and California. If he wanted to do so, there’s a long list of areas from which Sanders could choose. Amid growing political turmoil, during which the interim General National Congress (GNC) has lost even the pretense of control, Libyans will vote for a new ‘permanent’ parliament in elections tomorrow as the country slides into ever greater insecurity. Since the ousting of Muammar Gaddafi in August 2011, repeated attempts to introduce a measure of effective governance have failed, first by the National Transitional Council, and now by the GNC. On the eve of Libya’s elections, international observers say the voting was organized much too hastily and without adequate preparation. The risk is that, following the July 2012 elections for the GNC and the February 2014 constituent assembly elections to appoint a body to write Libya’s new constitution, a third set of botched elections could further undermine democracy. That’s especially true if voters in the eastern Libya of Cyrenaica don’t particularly bother to turn out. Just 1.5 million voters have registered to participate in the elections, down from the 2.865 million voters that registered for the 2012 vote. If those numbers hold up, turnout tomorrow will be much lower than the 1.76 million that participated in July 2012. Rather than wait for a new constitution to come into effect, the GNC hastily renamed itself the ‘House of Representatives,’ and late last month announced elections for June 25 to elect 200 members to the newly formed parliament. 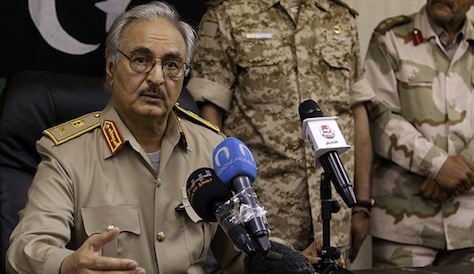 The GNC acted under considerable pressure from militia forces loyal to former Libyan general Khalifa Hifter (pictured above), who is waging an increasingly effective campaign, chiefly in Benghazi, to eliminate Islamists and Islamist-sympathetic militias throughout the country. Since the collapse of former prime minister Ali Zeidan’s government in March, Libyan governance has essentially crumbled. Zeidan, a liberal human rights attorney who lived in Geneva before returning to Libya after the 2011 civil war, was first elected prime minister in November 2012 after a contentious vote within a body that, from the outset, was severely divided between liberals and Islamists. 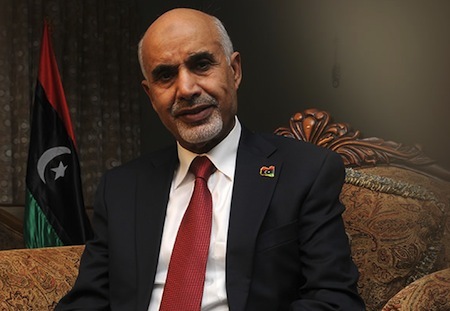 Though elected with the support of liberals, Zeidan only narrowly defeated Mohammed Al-Harari, the candidate of the Islamist Justice and Construction Party (حزب العدالة والبناء‎), the political wing of Libya’s Muslim Brotherhood. Over the course of his premiership, Zeidan presiding over an increasingly fractious interim government that gradually lost control of much of the country outside Tripoli. In fairness to Zeidan, it’s not clear if any government could have effectively asserted control over Libya over the past two years. As security increasingly faltered, Zeidan himself was kidnapped from a Tripoli hotel in October 2013 and held for hours in an aborted coup attempt. The final straw for Zeidan came earlier this year when, after growing tensions with conservative militias in Benghazi, eastern rebels commandeered an oil tanker, the Morning Glory, and sailed it halfway across the Mediterranean Sea before US Navy SEALS apprehended it. Though Zeidan initially fled Libya, he returned earlier this week, claiming that he is still legally Libya’s prime minister. 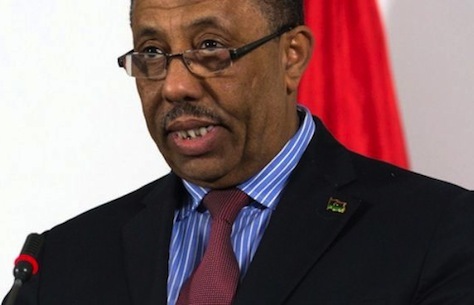 His successor, former defense minister Abdullah al-Thinni, tried to step down nearly a week later as interim prime minister after an attempt on his life. The GNC’s replacement candidate, Ahmed Maiteeq, a Misrata native and businessman, was disputed, and Libya essentially had two competing potential prime ministers until the Libyan supreme court ruled on June 9 that Maiteeq’s election was invalid, thereby restoring the reluctant al-Thinni as interim prime minister. Hifter’s rise has coincided with the political and security tumult. With significant support in western Libya, militia forces loyal to Hifter effective shut down the GNC earlier this spring, accelerating the decision to hold what amounts to snap elections for the new parliament. Today, Hifter’s leading the most notable anti-militia effort in Benghazi, after declaring himself the leader of ‘Operation Dignity’ in mid-May. Though Hifter’s offensive isn’t sanctioned by the GNC (nor by al-Thnni nor Zeidan nor Maiteeq), his efforts haven’t necessarily been unwelcome by some members of the Libyan government, notably within the interior ministry, which has struggled to implement law and order on a nationwide basis. Critics worry, however, that Hifter has aims to become a new Gaddafi-like dictator. Hifter has expressed high regard for Egypt’s newly elected president, former army chief Abdel Fattah El-Sisi, especially regarding el-Sisi’s crackdown on the Muslim Brotherhood within Egypt. Critics worry that Hifter is launching a military offensive to win the same kind of quasi-authoritarian power that El-Sisi now enjoys in Egypt. Intriguingly, Hifter is actually a US citizen. Once a Gaddafi partisan, Hifter led a disastrous military campaign in the 1980s in Chad. After his defeat and his subsequent capture by Chadian forces, Hifter joined forces with the anti-Gaddafi opposition and fled to exile, living in northern Virginia between 1990 and 2011, when he returned to Libya to help lead the anti-Gaddafi rebel forces. He was initially mistrusted by other leading rebel generals, however, and he’s the subject of significant speculation that he once worked with US military or other clandestine government officials. That means, as national voting takes place, Hifter’s forces are engaged in a dangerous showdown in Libya’s second-largest city against Ansar al-Sharia (كتيبة أنصار الشريعة), an Islamist militia that wants to adopt harsh shari’a law across Cyrenaica, the oil-rich region that’s home to Benghazi, if not the entire country. But it’s not the only place where violence is marring the election campaign. In Sabha, the historical capital of the southern Fezzan region, largely desert and sparsely populated, a parliamentary candidate was killed by gunmen on Tuesday. Ibrahim al-Jathran, another militia leader, who also fought to topple Gaddafi in the 2011 civil war, last summer took control of four eastern ports, thereby shutting down much of the Zeidan government’s ability to export oil. In a deal with Libya’s interim government soon after Zeidan’s ouster, Jathran permitted two of the ports to reopen, but oil production is still just around 12.5% of Gaddafi-era levels, gas stations in Tripoli are closed, and Libya remains subject to recurring power outages. Despite some temporary progress, Jathran still advocates a much more autonomous Cyrenaica, if not outright independence. 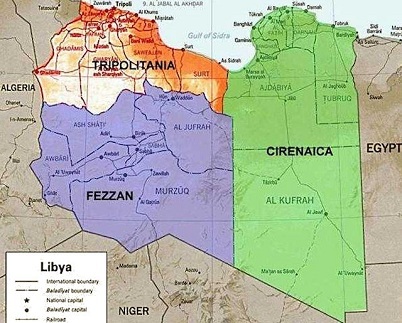 Though Cyrenaica is home to 1.6 million people (the bulk of Libya’s 5.7 million people live in Tripolitania, along Libya’s northwestern coast), much of Libya’s oil wealth is located in the eastern region. As if that weren’t enough, US special forces last week arrested Ahmed Abu Khattala, a Benghazi-based militia leader believed to be responsible for the September 2012 attack on the US consulate in Benghazi. Though Khattala’s arrest was widely hailed in the United States, Libyans have largely decried what they call the US’s violation of Libya’s national sovereignty. All of these issues — the standoff between Hifter and Ansar al-Sharia, Khattala’s arrest, the blockage of the country’s dwindling oil exports — threaten to dwarf this week’s election. The February elections to appoint the constitutional constituency assembly attracted just 500,000 voters. If the June 25 parliamentary elections feature similarly low turnout, it will be hard to argue that any party or group will have won much of a mandate for anything. That’s especially true if Islamists, which have typically been the most organized forces in elections held across North Africa since the Arab Spring revolts of early 2011, win the largest share of seats in tomorrow’s vote. That could empower Islamist militias in Cyrenaica and beyond, setting the scene for a long war of attrition between Hifter’s supporters and Islamist militias. Even before Zaidan took power, Libya has struggled in the post-Gaddafi era to form a coherent government, in no small part due to the failure of the Gaddafi regime to establish truly national institutions in Libya, where he came to power in a 1969 military coup, just 18 years after the country won full independence from British and French oversight. Under both Ottoman rule, beginning in 1510, and Italian rule, between 1912 and 1947, Tripolitania and Cyrenaica were governed as discrete provinces, with modern ‘Libya’ taking shape chiefly as a political construct in 1951. Up until independence, when the British relinquished full sovereignty over Tripolitania and Cyrenaica, the French were administering Fezzan separately. 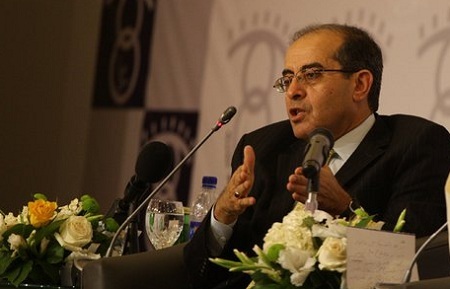 Mahmoud Jibril, a secular liberal, served as Libya’s first interim leader, between March 2011 and October 2011 when he chaired the executive board of the National Transitional Council. He stepped down just three days after Gaddafi was captured and killed by a mob in Gaddafi’s own hometown of Sirte. 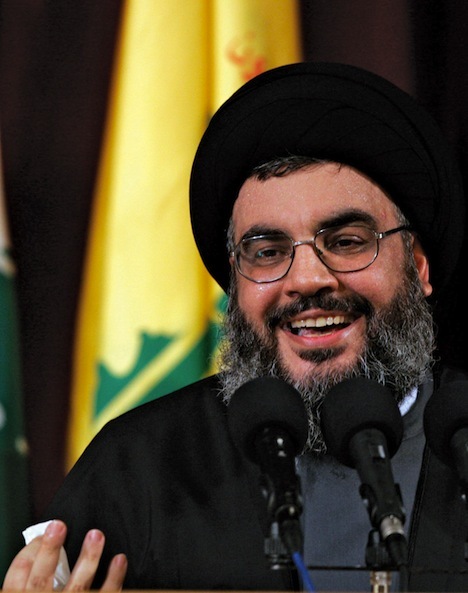 Jibril leads the National Forces Alliance (تحالف القوى الوطنية‎), a very mildly Islamist, liberal group that won the largest group of seats in the GNC in the July 2012 elections. At the time, however, Jibril’s influence was at its peak, and no one expects his group to repeat the successes of the 2012 election. Abdurrahim El-Keib was elected by the National Transitional Council in November 2011, and he guided Libya through the September 2012 election of the interim GNC. Photo credit to Reuters / Esam Omran Al-Fetori. I’m always super-hesitant to jump into commentary on American politics, mostly because there’s so much to learn about politics and policy elsewhere in the world. But the decision by the US House of Representatives and House speaker John Boehner on Thursday to form a select committee to ‘investigate’ the Benghazi attacks is one of the reasons I find US politics so utterly discouraging. A select committee is a ‘special’ committee created for a specific, targeted purpose. The House typically creates a select committee when one or more of the existing House committees don’t have enough authority or capacity to carry out that purpose. For example, between 2007 and 2011, the House, under Democratic control, authorized a select committee on energy independence and global warming. Of all the mistakes that US president Barack Obama has made in six years in foreign policy, the Republican leadership has generally focused on the Benghazi sideshow — at the expense of more fundamental and, constitutionally controversial matters. 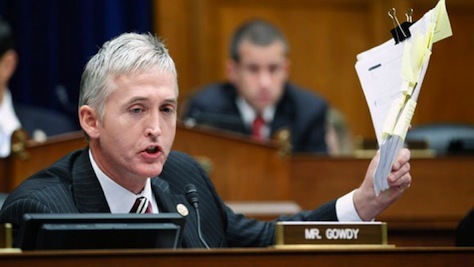 It’s easy to understand why ‘Benghazi’ makes for such a sensational affair. The attack left four US personnel, including Christopher Stevens, the US ambassador to Libya, dead. It left the Obama administration, just weeks before a presidential election, slack-jawed to explain why US security failed so spectacularly. Add to that the post-Watergate alchemy, whereby shouting ‘cover-up’ can spin routine politics into scandal, a White House that’s been reluctant, perhaps understandably, to work enthusiastically with its Congressional interlocutors, and a zero-sum political environment where House Republicans show, time after time, that they are willing to take extraordinary measures to achieve certain objectives (e.g., last autumn’s government shutdown, routine debt ceiling crises). Just a little over a week after Libya’s prime minister Ali Zaidan was sacked over the country’s deteriorating security situation, its newly appointed interim prime minister Abdullah al-Thinni has resigned after threats on his life and the lives of his family members. In the United States and Europe, Libya long ago fell from the headlines, despite the support that NATO allies provided to the rebels that sought to oust Muammar Gaddafi in 2011. But over three years after Gaddafi fell from power (he was captured during an attempt to escape his hometown of Sirte and brutally murdered by a mob), Libya is not in particularly good shape. Oil production has allegedly fallen to just 12.5% of its Gaddafi-era levels, as the central government and regional militias play a game of tug-of-war over potential oil revenues. Meanwhile, the Libyan government is unable to guarantee security throughout much of the country, especially outside Tripoli. In the United States, ‘Benghazi’ has become a code word for conservative Republicans hinting at a dark cover-up within the administration of US president Barack Obama about who actually perpetrated the attack on September 11, 2012 against the US consulate in Benghazi, Libya’s second-most populous city. The furor stems largely from comments by Susan Rice, then the US ambassador to the United Nations and a candidate to succeed Hillary Clinton as US secretary of state, that indicated the attack was entirely spontaneous, caused by protests to a purported film trailer, ‘Innocence of Muslims,’ that ridiculed Islam and the prophet Mohammed. Republicans immediately seized on the comments, arguing that al-Qaeda was responsible for the attack, which left four US officials dead, including Christopher Stevens, the US ambassador to Libya at the time, a volatile period following the US-backed NATO efforts to assist rebels in their effort to end the 42-year rule of Libyan leader Muammar Gaddafi. Similarly named groups have emerged throughout north Africa and the Arabian peninsula over the past few years — a group calling itself Ansar al-Sharia, not ‘al-Qaeda in the Arabian Peninsula’ (AQAP), took control of portions of southern Yemen after the battle of Zinjibar in 2011. The United States ultimately listed ‘Ansar al-Sharia’ as an alias for AQAP, but it’s unclear the degree to which the two are (or were) separate. It also underscores the degree to which local Islamist groups like AQAP are necessarily fueled by local interests and concerns . Most Yemenis fighting alongside AQAP are doing so for local reasons in a country that remains split on tribal and geographic lines — South Yemen could claim to be an independent state as recently as 1990. Groups also named Ansar al-Sharia also operate in Mali, Tunisia, Mauritania, Morocco and Egypt, and some of them have links to al-Qaeda affiliates and personnel. Others do not. Moreover, if there’s a scandal involving the Obama administration, it’s the way in which the United States came to enter the Libyan conflict in 2011. 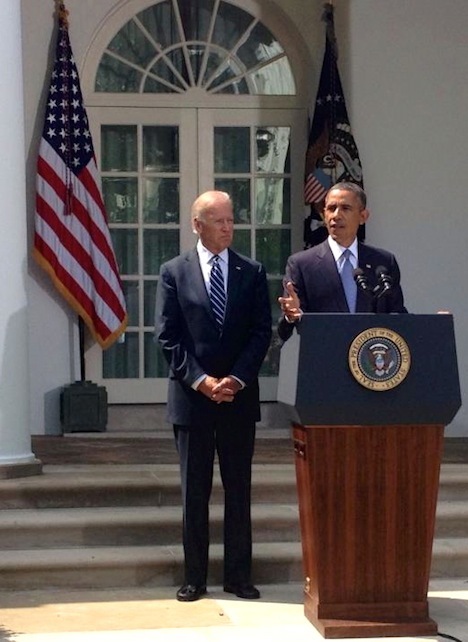 The Obama administration refused to seek authorization from the US Congress when it ordered military action in Libya in support of the NATO mission and to establish a no-fly zone, pushing a potentially unconstitutional interpretation of the 1973 War Powers Resolution, which requires Congressional authorization for open-ended conflicts that last for more than 60 days. Ironically, Obama’s case for ignoring Congress was actually stronger with respect to potential airstrikes on Syria earlier this year, though Obama’ ultimately decided to seek Congressional support for a potential military strike in August in response to the use of chemical weapons by Syria’s military. Republicans, who control the US House of Representatives but not the US Senate, the upper house of the US Congress, just as they did in 2011, could have (and should have) held Obama more accountable for his decision vis-à-vis the War Powers Resolution. Instead, they’ve colluded with a conservative echo chamber that mutters ‘Benghazi’ like some unhinged conspiracy theory, suggesting that somehow the Obama administration purposefully lied about what happened that day. The reality is that the Obama administration was as caught off guard as anyone by the attack. Democrats that would have howled with disgust over Benghazi if it had happened under the previous administration of Republican George W. Bush have remained incredibly docile during the Obama administration — to say nothing of the Obama administration’s encroaching internet surveillance, ongoing war in Afghanistan, frequent use of drone attacks and pioneering use of ‘targeted killings’ (including assassination of US citizens). The C.I.A. kept its closest watch on people who had known ties to terrorist networks abroad, especially those connected to Al Qaeda. Intelligence briefings for diplomats often mentioned Sufian bin Qumu, a former driver for a company run by Bin Laden. Mr. Qumu had been apprehended in Pakistan in 2001 and detained for six years at Guantánamo Bay before returning home to Derna, a coastal city near Benghazi that was known for a high concentration of Islamist extremists. “The enmity between the American government and the peoples of the world is an old case,” he said. “Why is the United States always trying to use force to implement its agendas?”…. Who is Ibrahim Boubakar Keïta? Though we still have not heard any official results from Mali’s historic Sunday election, which were initially due Tuesday and have now been postponed until tomorrow, it’s hard to escape notice of the unofficial word that former prime minister Ibrahim Boubakar Keïta is leading the vote, perhaps by a large enough margin to avoid a planned August 11 runoff. It’s difficult to know whether the delays are from the actual vote-counting itself or from behind-the-scenes talks among the various stakeholders in the election results. Either way, when the votes are announced tomorrow (the last day that election officials have under law to announce them), it seems all but certain that Keïta (pictured above) will come out on top in a vote that saw the highest turnout in Mali’s history — around 53%. Election observers, who have had consistent access to voting conditions in Mali, in contrast to yesterday’s vote in Zimbabwe, largely reported that Sunday’s election was essentially free and fair. But another leading contender, Soumaïla Cissé, has already warned that he will challenge the results if Keïta, popularly known simply by his initials, ‘IBK,’ wins the first round outright, and his party has accused IBK’s supporters of ballot-stuffing. Keïta appeared to be running particularly strong in Bamako, Mali’s capital in the south of the country, though Cissé, who was born in the northern city of Timbuktu, claimed that he was running stronger in the country’s interior. Despite meeting the basic thresholds for a legitimate election, there have been concerns that in holding such a hasty vote after the country’s recent liberation, the election would be marred by insufficient time for a issues-based campaign, by flaws in the mechanics of holding a new vote, and by the fact that a million northerners remain displaced inside Mali or in neighboring countries. The election was the first following a political crisis that saw the country’s elected president since 2002, Amadou Toumani Touré (also known by his initials, ‘ATT’), toppled in a military coup last March, thereby postponing what had been the planned March 2012 election to choose a successor to Touré. The coup, however, subsequently emboldened Tuareg separatist resistance groups in the north, and Malian forces were unable to prevent the takeover of much of northern Mali, first by Tuareg groups like the National Movement for the Liberation of Azawad (MNLA), and later by homegrown and foreign-based Islamic radicals, who introduced sharia law in Timbuktu, one of the largest cities in northern Mali. French president François Hollande launched a military intervention in February 2013 to liberate the north and to secure the transitional government’s control of Bamako. France and the United States have both pushed for rapid elections in order to facilitate permanent peace talks between Bamako and Tuareg separatists, in hopes that it will secure the Sahel region from transformation into a base for Islamic terrorism. In an otherwise busy weekend for elections, voters in Mali went to the polls yesterday to select a new president, despite the fact that the country has a long way to go in securing a peace agreement to definitively end the crisis of the past 16 months. It’s no secret that the international community has pushed for an ambitious timetable, just months after France sent troops to the country to restore order by pushing back Tuareg rebels and disparate Islamist groups that had taken control of northern Mali and threatened to overwhelm Bamako, Mali’s capital in the south. Accordingly, French leaders are anxious to have an elected president that can push for a lasting peace between a legitimate central government and the separatist Tuaregs in the north. 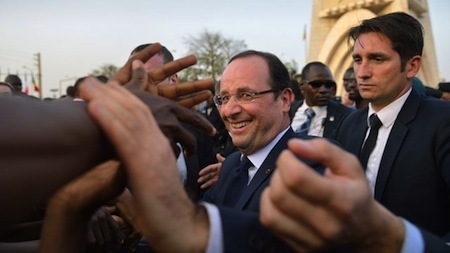 French president François Hollande, aware of France’s heavy-handed history with respect its former African colonies and the legacy of Françafrique, has pushed for as rapid a transition as possible to a stable Mali. The United States and other Western governments also want an elected government in order to renew political and other humanitarian aid to the country that’s been on hold since a military coup in March 2012 that ousted Amadou Toumani Touré (known popularly as ‘ATT’ in Mali). But given that France’s military mission only ended in February, there’s been a steady stream of criticism from both inside and outside Mali that the country was not yet ready for an election so soon after its political crisis, and that Paris and other Western governments had pushed Mali into an election sooner than necessary in order to stitch up a peace deal rather than secure a long-term political settlement. On one hand, Sunday’s presidential race was itself an extension of the postponed election originally planned for March 2012, which was cancelled in the aftermath of last year’s coup that only exacerbated the turmoil in northern Mali, and three of the four frontrunners in Sunday’s race had previously planned to run in the March 2012 vote. 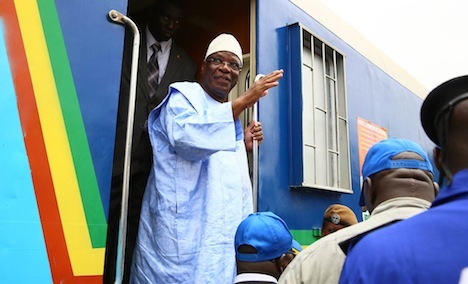 ATT, who had governed Mali since 2002, had announced he was stepping down and, before the ill-timed coup, Mali seemed set for a fairly normal election and a peaceful transfer of power from ATT to a new administration. It’s also true that the installation of a new government with the legitimacy of a popular mandate could accelerate the momentum for a permanent ceasefire with northern rebels, and the restoration of U.S. aid will certainly boost investment. But on the other hand, it’s not at all clear that Mali is ready to make that transition when life is still returning to normal — nearly half a million Malians have either fled to neighboring countries in the Sahel or remain internally displaced, and the rush to Sunday’s vote was plagued with confusion over establishing polling places, distributing biometric voter cards in a country of 16 million people and revising voter rolls that had not been updated in four years. It remains to be seen if northern Malians, some of whom still support the National Movement for the Liberation of Azawad (MNLA) that declared the independence of the northern territory of Azawad and some of whom are voting abroad or elsewhere in the country, will deem the vote to have been legitimate. Although the French forces are largely seen as having been successful earlier this year in ending Mali’s crisis, it was Western intervention in the region that may have led to the fighting in the first place. Although northern rebel groups have continuously agitated for autonomy since Mali’s independence in 1960, there’s a strong case that Western-provided arms made their way from rebels in Libya fighting against Muammar Gaddafi. Once Gaddafi fell from power, those arms found their way from sympathetic Libyans to nomadic northern Tuaregs, who share much more in common culturally and politically with Libyans than with their southern Malian countrymen. Given the bumbling role of Western powers that arguably fueled Mali’s crisis, the specter of unintended adverse consequences looms large. Sunday’s vote seems to have gone about as well as reasonably expected, however, and it may have well marked the largest turnout of any election in Malian history. Despite fears to the contrary, the voting took place without any violence in Mali’s north, and there were no reports of massive fraud or systemic errors, and that should be deemed as an initial success. U.S. president Barack Obama will shake up his national security team today with the announcement that national security adviser Tom Donilon will be stepping down. 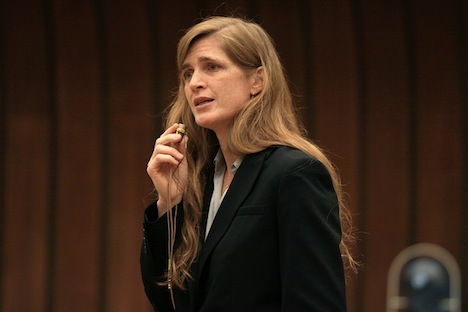 In his place will come Susan Rice, the current U.S. ambassador to the United Nations, and in Rice’s place will come Samantha Power as the new UN ambassador (so long as Power is confirmed by the U.S. Senate). That will place Rice and Power at the vanguard of the administration’s foreign policy for the next three and a half years, and it will anoint both of them as potential U.S. secretaries of state in future Democratic presidential administrations — Rice was considered a frontrunner to succeed Hillary Clinton as secretary of state earlier this year, though she ultimately lost out to former U.S. senator John Kerry after Senate Republicans made clear that they would hold up Rice’s nomination over her role in the administration’s handling of the attack on U.S. diplomats in Benghazi. Both women share a perspective that the United States has a role to play to boost human rights around the world, including through the use of military force. Rice, who served in the administration of U.S. president Bill Clinton, ultimately as assistant secretary for African affairs, has often said that U.S. failure to intervene in Rwanda during the 1994 genocide and the Hutu massacre of 800,000 Tutsis was a defining moment. Power (pictured above), a former journalist who covered the fighting in the Balkans and the ‘ethnic cleansing’ of Bosnia-Herzegovina in the early 1990s, has been even more outspoken on the role of U.S. policymaking and its impact on human rights. Before joining the Obama administration as the senior director for multilateral affairs and human rights, Power won a Pulitzer Prize for her 2002 book, ‘A Problem from Hell’: America and the Age of Genocide, which takes the U.S. government and others to task for standing by as genocide occurred in Armenia, Cambodia and Rwanda. As such, Libya plays a central role in the careers of both officials who, along with Hillary Clinton, were among the proponents arguing for the Obama administration to take an active role in Libya to assist rebels trying to overthrow longtime strongman Muammar Gaddafi. That placed them at contretemps with more traditional foreign policy realists like Donilon and Bob Gates, the U.S. defense secretary at the time. Their success led to a NATO-backed no-fly-zone in Libya and, later, the arming of anti-Gaddafi rebels by NATO allies. The NATO efforts accomplished the goal, and Gaddafi lost control of Libya in August 2011 and he was executed by rebels in October 2011. In the tradition of U.S. foreign policy, party labels like Democrat and Republican often matter less than where officials fall on the line between liberals and realists (as the terms are commonly understood in international relations theory). So as Donilon leaves the White House and Rice and Power ascend, the big story today is less about any one individual than the shift of the Obama administration much further toward the liberal IR perspective. Though Senate Republicans will not have the opportunity to question Rice because her role doesn’t require Senate confirmation, they will have an opportunity to question Power and will almost certainly bring the discussion back to Benghazi. But Benghazi’s relevance as a ‘scandal’ is somewhat dubious, especially when there are at least two more important fundamental issues about the administration’s approach to Libya. The first has to do with U.S. constitutionality and the separation of powers. Whereas the Bush administration sought a vote in the U.S. Congress authorizing its military action in Iraq back in 2002, the Obama administration controversially argued that its military engagement in Libya, at a cost of over $1 billion, never reached the level required to notify the U.S. legislature and seek congressional approval under the Vietnam-era War Powers Resolution. Critics claim that the law required the Obama administration to obtain authorization to continue the Libya operation within 60 days of its inception. More significantly for world politics, however, are the adverse, unintended consequences of arming the anti-Gaddafi rebels. Some of those arms ended up in the hands of Libyan jihadists, and many more ended up in the hands of all sorts of rebels in northern Mail, including jihadists, Islamists and Tuareg separatists, triggering a crisis that toppled Mali’s government and required French military intervention to stabilize the country. There’s a strong argument that U.S. military intervention in Libya in 2011 prioritized the short-term political rights of anti-Gaddafi rebels at the expense of the human rights of northern Malians and, potentially, the human rights of everyone within the African Sahel, which remains a precarious new security challenge. Earlier this weekend, French president François Hollande flew to Timbuktu in Mali, where French forces have only in the last week cleared the historic city of Islamist control. I was quick to argue that the intervention in Mali wasn’t some neocolonial retreat to Françafrique, and for a three-week military campaign, I’ll be the first to agree that Hollande’s intervention seems to have saved Bamako, Mali’s southern capital, from pending capture — or at least from pressure from Islamist rebels that were quickly closing in on Bamako after locking down control of the northern two-thirds of the country. But given that the Timbuktu trip had a ‘mission accomplished’ feel to it, after just three weeks of French military effort, I’m not sure whether Hollande will ultimately come to regret such a high-profile event — as former U.S. president George W. Bush learned, prematurely spiking the ball is not smart politics. You might think that Hollande’s success so far in Mali should be helping him at home politically, but budget woes, tax policy and continued economic weakness have nonetheless kept Hollande’s approval ratings incredibly low as he enters only his 10th month in office — only 35% of French voters continue to have confidence in Hollande, opposed to 61% who do not, pursuant to a TNS Sofres poll from January 30. 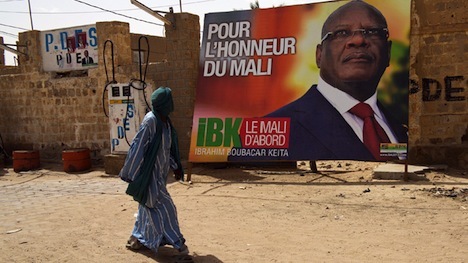 First and foremost, where does Mali go from here? If and when the French forces leaves, won’t the Islamist and Tuareg rebel forces simply re-emerge from their northern rural enclaves? In contrast, if French forces really stay long enough to push the more radical Islamist elements out of Mali, won’t they just create a new problem in another country? Mauritania doesn’t seem like an incredibly bad place for al-Qaeda in the Maghreb to target next. Given that the French-backed effort to arm rebels in Libya against Muammar Gaddafi might have destabilized Mali by flooding north and west Africa with additional weapons, it’s not too early to wonder if the Mali effort will result in further unintended consequences, like so many falling dominoes. It’s no secret, too, that U.S. aid to the mujahideen in the 1970s and 1980s in Afghanistan empowered the radical Islam that bloomed in the 1990s and turned against the United States by sponsoring al-Qaeda and other terrorist groups and, indirectly, resulted in the current U.S. quagmire in Afghanistan. So there’s no way to know what follow-on effects the French offensive will have. Over the weekend, France found itself engaged in a new, if limited, war — and a new theater of Western intervention against radical Islam. French president François Hollande confirmed that French troops had assisted Mali’s army in liberating the city of Konna — in recent weeks, Islamist-backed rebels that control the northern two-thirds of the country had pushed forward toward the southern part of the country, threatening even Mali’s capital, Bamako. 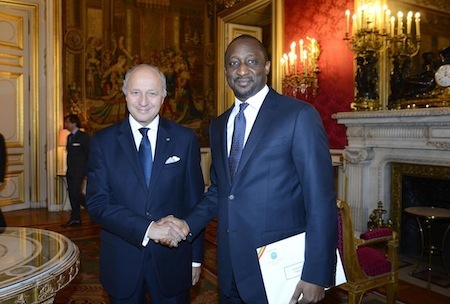 Hollande and his foreign minister, Laurent Fabius (pictured above with Malian foreign minister Tyeman Coulibaly), now face the first major foreign policy intervention of their administration, extending a trend that began under former president Nicolas Sarkozy, who spearheaded NATO intervention in support of rebels in Libya against longtime ruler Muammar Gaddafi and for the apprehension of strongman Laurent Gbagbo in Côte d’Ivoire in 2011. 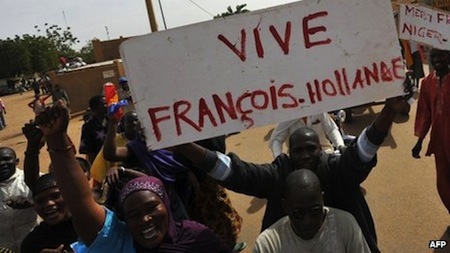 Foreign Policy‘s Joshua Keating has already called the Malian operation the return of Françafrique. Françafrique refers to the post-colonial strategy pioneered largely by French African adviser Jacques Foccart in the 1960s whereby France’s Fifth Republic would look to building ties with its former African colonies to secure preferential deals with French companies and access to natural resources in sub-Saharan Africa, to secure continued French dominance in trade and banking in former colonies, to secure support in the United Nations for French priorities, to suppress the spread of communism throughout formerly French Africa and, all too often, source illegal funds for French national politics. In exchange, French leaders would support often brutal and corrupt dictatorships that emerged in post-independence Africa. But to slap the Françafrique label so blithely on the latest Malian action is, I believe, inaccurate — French policy on Africa has changed since the days of Charles de Gaulle and, really, even since the presidency of Jacques Chirac in the late 1990s. After all, the British intervened just over a decade ago in Sierra Leone to end the decade-long civil war and restore peace for the purpose of stabilizing the entire West African region, and no one thought that then-prime minister Tony Blair was incredibly motivated by contracts for UK multinationals. Given the nature of the Malian effort, it’s quite logical that France — and Europe and the United States — has a keen security interest in ensuring that Bamako doesn’t fall and that Mali doesn’t become the world’s newest radical Islamic terrorist state in the heart of what used to be French West Africa. Fabius, a longtime player in French politics, and currently a member of the leftist wing of the Parti socialiste (PS, Socialist Party), served as prime minister from 1984 to 1986 and as finance minister from 2000 to 2002, though his opposition — in contrast to most top PS leaders — to the European Union constitution in 2005 has left him with few friends in Europe. Nonetheless, Fabius argued yesterday that it was not France’s intention for the action to remain unilateral — African forces from Nigeria and elsewhere are expected to join French and Malian troops shortly, UK foreign minister William Hague has backed France’s move, as has the administration of U.S. president Barack Obama — and today, the United Nations Security Council has also indicated its support for France’s efforts as well. Today’s U.S. — and world — media are likely to be focused on the attack on the U.S. consulate in Benghazi and the resulting deaths of U.S. diplomatic personnel there, including the U.S. ambassador to Libya, Christopher Stevens. That’s crazy, given that today has already seen the jarring attacks on the U.S. embassy in Cairo, an attempted assassination on the new Somali president, and amid increasingly public tensions between the United States and Israel over Iran’s nuclear program. And that’s just in the Middle East — today is also a big day for Europe, with the Dutch elections and the German constitutional court’s decision to uphold the European Stability Mechanism. “On behalf of the presidency of GC, government and the Libyan people we offer deep condolences to the American government, people and the families of the ambassador and other victims,” the statement said. “While we strongly condemn any attempts of insult the person of the Prophet and our sanctities or tampering with our beliefs,” we reject the use of force and terrorizing innocent civilians, said Magariaf. Al-Magariaf was elected the president of the General National Congress of Libya on August 12, making him Libya’s interim (for now) head of state. As among the three Muslim countries that the United States has liberated in the past decade, for better or worse, al-Magariaf contrasts with Iraq’s Nouri al-Maliki and Afghanistan’s Hamid Karzai in that he is less corrupt and more dependable. Among the three countries (and Pakistan, too), he is by and far the friendliest and most helpful leader. Al-Magariaf is from Benghazi, where the attack took place. Benghazi is Libya’s second-largest city and the urban center in the eastern Cyrenaica region of Libya (in contrast to the coastal northwestern Tripolitania and southwestern Fezzan). 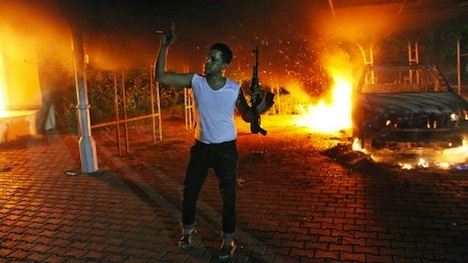 Benghazi is also, ironically, where the revolt against Libyan strongman Muammar Gaddafi began in 2010. The GNC, an interim parliament called for the purpose of running Libya’s government until an elected Constituent Assembly can draft a new constitution for Libya, was appointed following Libya’s first free election in decades on July 7 — among the 200 members, 120 seats were reserved for political independents and 80 for political parties. Among the 80 seats reserved for political parties, Mahmoud Jabril’s National Forces Alliance (تحالف القوى الوطنية) won 39, and it was seen as a victory for moderates — the Muslim Brotherhood’s Justice and Construction Party (حزب العدالة والب) won just 17 seats. Al-Magariaf himself represents the National Front Party (حزب الجبهة الوطنية‎), a successor to the National Front for the Salvation of Libya, a group al-Magariaf formed in 1981 in opposition to Gaddafi, who ruled Libya from 1969 until just last year. The National Front Party won just three seats, but al-Magariaf has a long record of opposition to Gaddafi and good relations with the Muslim Brotherhood in Libya. Al-Magariaf is a political liberal more interested in rebuilding Libya’s government and economy than promoting Islamic rule, but is viewed with less suspicion than Jibril, who served in Gadaffi’s administration from 2007 to 2011 as the head of Libya’s National Economic Development Board in an effort to revitalize and privatize the Libyan economy. Although al-Magariaf served as Libya’s ambassador to India until 1980, he defected in Morocco in that year, and remained in exile in the United States as the leader of the National Front until his return to Libya just last year. Official results from Libya’s July 7 election have trickled in, and the result is being hailed as a victory for Mahmoud Jibril (محمود جبريل), pictured above. His National Forces Alliance (تحالف القوى الوطنية) won 39 seats among the 80 seats that were available for political parties in the General National Congress, while the Muslim Brotherhood’s Justice and Construction Party (حزب العدالة والب) won just 17 seats. The GNC will run Libya’s government until an elected Constituent Assembly can draft a new constitution for Libya — among its 200 members will be 120 “independents,” many of whom are unaligned with either Jibril’s coalition or the Brotherhood. International and Libyan media immediately started to crown Jibril and the “secularists” as the winners as it became clear the NFA was leading against the Brotherhood’s candidates, but it remains unclear that Jibril’s group — which has distanced itself from the “secular” label — will necessarily control the GNC. Jibril himself was not eligible to stand for election, so he will not actually be a member of the GNC. “This new coalition will be a nationalist one,” he said. Jibril served as the interim prime minister for a little over seven months as head of the National Transitional Council, which gained international recognition as the Libyan government from mid-2011 onward. Jibril stepped down, as promised, upon the capture of Sirte and the killing of longtime Libyan leader Muammar Gaddafi. His newly-formed National Forces Alliance is a union of liberals that have called for a civil democratic state and are proponents of moderate Islam. But many Libyans are also wary of Jibril, who has very close ties to the United States and to Europe, and who served from 2007 until 2011 as the head of Libya’s National Economic Development Board, where he developed a close relationship with Saif al-Islam Gadaffi. He was one of Libya’s leading proponents of privatization of state-run industries and liberalization of the Libyan marketplace to greater commercial ties with and development from the U.S. and Europe. Today’s news was mixed for French president Nicolas Sarkozy. A new poll shows him with his first-ever lead in the first-round April 22 presidential election — at 28.5% to just 27% for Partis socialiste candidate François Hollande. Hollande has a slimmer but still quite commanding second-round lead, where he polls 54.5% to Sarkozy’s 45.5% for the May 6 runoff. Centrist François Bayrou held steady at 13%, but Front National candidate Marine Le Pen lost a point from the prior survey and Jean-Luc Mélenchon gained 1.5%, at 10% his highest poll rating to date. 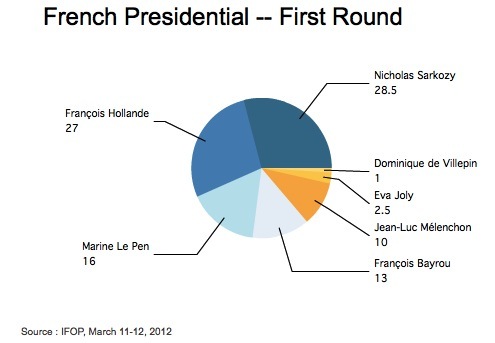 The shift of voters away from Le Pen (presumably to Sarkozy) and to Mélenchon (presumably away from Hollande) is more than enough to explain first-round movement between Hollande and Sarkozy.